Kuala Lumpur, Malaysia, February 12, 2018 – Epson, a world leader in digital imaging and printing solutions, today unveiled the very first Epson Solution Centre in Wisma Consplant, Subang Jaya, that is set to be a one-stop platform for the company to demonstrate innovative solutions that will boost the company’s local business growth and support customers in Malaysia better. 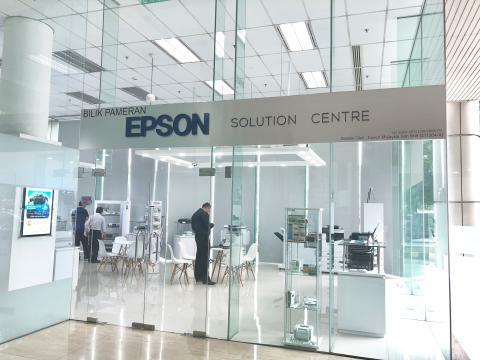 “We are pleased to unveil and make available the Epson Solution Centre for our customers in Malaysia. This is in line with the ‘Epson 25’ Corporate Vision, with which, we mandate for ourselves to create a connected age of people, things and information, supported by efficient, compact and precision technologies that generate value for customers. We are strengthening our business infrastructure in the region to support these efforts and this Malaysian solution centre is one of them,” said Daisuke Hori, Epson Malaysia’s Managing Director. The 5,000 sq ft centre showcases and demonstrates products from three of Epson’s key pillars of innovation, namely printing & imaging, visual communications and wearables, with the aim to help customers better understand how Epson solutions can help their business. “Epson Solution Centre will be the ideal place where customers can come and experience, in a realistic business setting, what our products can do for their business. We believe that this solution centre will help us to serve our B2B customers better andto support our business growth,” elaborated Danny Lee, General Manager, Sales & Marketing, Epson Malaysia. Visual Communications experience – large scale projection installation, education, business and home entertainment for high brightness projectors, business projectors & interactive projectors, and home projectors. Epson’s latest range of holistic and integrated solutions in the visual communication space launched late January is also showcased here. Printing & Imaging – from SOHO to commercial and industrial use across ink tank printers, business inkjets, scanners, and label printers. Wearables – Moverio smart eyewear. The centre will also house a Customer Service Centre, where customers can send in products for service or troubleshooting, as well as training and meeting rooms. Additionally, Epson also made available the world’s first 3LCD ultra short throw laser home theatre projector, the EH-LS100, bringing bright big-screen projection to homes. Epson’s first ultra-short throw laser projector for homes, the projector’s ultra-short throw design allows it to project at extremely close distances to a wall without need for mounting on ceiling, enabling easy installation and a seamless integration with the home décor.